lintville had the Baptist, Methodist, and Cumberland Presbyterian churches. The Baptists had a preacher two Sundays a month, the Methodists had a preacher one Sunday and the Presbyterians one Sunday. So we went to preaching every Sunday except the fifth Sundays. We got up on Sunday mornings and did our usual thing, then got dressed in our Sunday clothes and walked to Flintville to Sunday School and preaching. After preaching, we walked home for lunch, then walked to Holman’s Chapel for Sunday School and singing, then down to the fish hatchery for an hour or two, then home, then back to Flintville for church again and then home. Thinking back now, we must have walked all day every Sunday. Some fun, huh? The church was always the back bone of the community. Everyone has to have someone or something to blame for all the things that go wrong in their lives. Who better to blame than the devil? The better the Christian, the more the devil tempted them by making their body sick, or making their cow die—or anything bad. The church was also a social gathering place. There were very few places of entertainment. And people didn’t feel so guilty about not working around the clock if they went to church or were involved in church work. During the 1930s there were great religious revivals everywhere. In Flintville and other small places, every summer, usually in August, there would be a visiting preacher for a week, or sometimes two weeks. There would be preaching every morning and to the young people’s delight there would be another service at night. The purpose of a revival was so the Christians could renew their faith and sinners could be saved or converted. Then the new Christians were baptized and became members of the church. In 1929 or 1930 Flintville had a revivalist from Atlanta, Georgia. The pastor at Flintville Baptist preached two Sundays a month in Flintville and two Sundays at Elora, about six miles away. It was decided that there would be two weeks revival at Flintville and two weeks at Elora. So the visiting minister preached two sermons a day for four weeks. There was a great revival all over the county and all of us teenagers were in hog heaven. We didn’t go days, but we had a chance to see our friends every night for four weeks! There were a great many ‘saved’ and joined the church that year. In fact, I want to say 160 were baptized at the water hole by the rail road track, but I guess it was sixty. The people from Elora were baptized there too. But, the revival that year was so successful that the next year, they asked the same preacher to come back for two weeks. But everybody was saved the year before so the revival was going very badly. So bad in fact, that they decided that they would break up after one week. We kids didn’t want them to do that! We girls talked some of the boys into going down to be prayed for. That made things pick up some. Then Laura McDonald said she would do her stuff. She shouted all over that church! It was so successful that the revival ran another week, but only me and Clifton Holt were baptized. We were baptized at the blue hole. The water came almost to our knees. I wore a raincoat. We lived about a mile from the church. At night the preacher might preach for two hours, then the woman they always asked to do the benediction would pray for thirty minutes. You might fall asleep and then wake up and realize you had to walk home in the hot dark or the winter freezing weather. On cold nights, how cozy it was to snuggle down between Dora and Nora! They wouldn’t even wake up, but grumble at one another. And one summer night we got home about eleven o’clock and Mama was throwing buckets of water around. She wouldn’t even let us lay down. She said it was so hot that we’d die if we quit moving. I wonder how hot it was? It had to have been bad, for we were used to hot weather. I swear this is true! I got tickled and Thaniel literally threw me out a window feet first and followed me. All religions are good but so many people tend to over-do it. So we become narrow-minded and bigoted. There is nothing new under the sun. Everything has been with us since the beginning: wars, peace, hate, love, divorce, adultery, murder. Everybody has to feel better than someone else, so we are prejudiced against other races, fat people, thin people, or whatever. The God that I know is a good God and He is as good to all of us as we will let Him be. I am truly blessed! Anyway, going to church and reading was just about our only entertainment. There were very few books except the classics like Shakespeare and books of poetry. If anyone was lucky enough to get a magazine, it was saved and swapped or passed from hand to hand. The Grit paper cost three cents and Tommy Tucker ordered twenty copies a week to sell in Flintville. Nobody could afford the three cents every week so it was saved and passed on to others. That way you got to read it every week. Almost everyone had a King James Version of the Bible, and sometimes, that was the only book in the house. Most of the time the father was the only one who could or did read the Bible. Even as recent as the late 1800’s it was the law that you had to attend church. If you lived too far away, the traveling preacher would go by every two or three months to read the Bible, to marry the people who had already been living together, or to bury the dead who had already been buried. The dead were not embalmed so you could keep them only one night before burying them. As soon as a person died, members of the family or neighbors would wash the body all over, put the best clothes on it, and lay it on boards in the coolest place they could find: generally before a window. Somebody else would be making a coffin and when the coffin was ready the body was put in and arranged for the neighbors and family to see it. Then it was buried. This may be a good time to tell a ghost story. There was a man, woman and their two grown boys who lived behind us about one fourth mile away in the woods. As I said, Mama always sat with the sick, helped deliver babies, and helped lay out the dead. Well, the woman was dying with T.B. Mama went over every night after supper, got the woman cleaned up and generally stayed there until about two o’clock in the morning. Comer, me, or Mary Will would go with her so she wouldn’t have to walk home alone in the dark. Then the woman died. The oldest boy had gone away somewhere (for they were almost outcasts in Flintville) and got a wife. They lived with his father and brother. She got pregnant right away. Then about a week before time for her to have the baby, the younger brother got what they called galloping T.B., and he died. Mama and Mrs. Shubert laid him out. He was on some planks in front of an open window with a sheet over him. Mama sent me and Comer with Ruth and Coy Reynolds to sit up with the body. I don’t know why, but they always sat up with the dead. We were too scared to speak—only pointed. It shook him up for a minute, then he said, “Nonsense!” and went and jerked the sheet off. A cat had gotten under the sheet! Some ghost, huh? We thought so! Last summer at the 1990 Weir reunion Buford reminded me of a ‘ghost’ story. Boys and young men wore white pants and shirts in the summer time. I’d been trying to get a date with this one boy for a long time. Finally, one night he asked if he could walk me home after church. Buford was at Vollie’s, as usual. We got to my house and the boy started back home. It was a moonless night, but the stars were making a little light. Down below the house in the woods was a spooky hollow that you had to walk through to get to our house. That night going through the spooky hollow Buford and Merce got just a glimpse of one another. They slowed down and started edging away from one another on opposite sides of the road. Then they started running, but one of them fell down and made a noise. Then they realized that they were not seeing a ‘ghost’. But that boy never asked me for another date. I guess that’s the way ghost stories get started. If one of them had not fallen down they each would have told about seeing a ghost. Then other people would have started looking and that would have become known as a haunted place. We got our first radio in 1929. It played on a battery and you listened mostly to the Grand Ole Opry from Nashville or Chicago Hayride, or Louisiana Hayride from New Orleans, or the Christian station from Del Rio, Texas. Mama said, “Yes, Mary Will, go.” I said, “She’ll kill you.” But, Mama said go, and she went. She got the hell beat out of her and came back. Elizabeth was only twelve, but Mama told her to go. I told her not to go. Mary Will told her not to go. Mama said go, and she went. We all followed her. She got the hell beat out of herself too. And the funny thing about it all was that I wouldn’t even speak to Alf Pruitt much less go to the show with him. He’d never gone to school a day in his life. He was good looking but was at least five years older than me, and if I’d looked at him, Mama would have had a fit. I still think that Ola caused that fight, for Elizabeth’s sister-in-law was Ola’s aunt. In Flintville, Tennessee we never went to the movies because the theater was in Fayetteville, eighteen miles away, over a dirt, pot-holed road. It could take up to three hours to go that eighteen miles. And we never went to a circus in Tennessee. 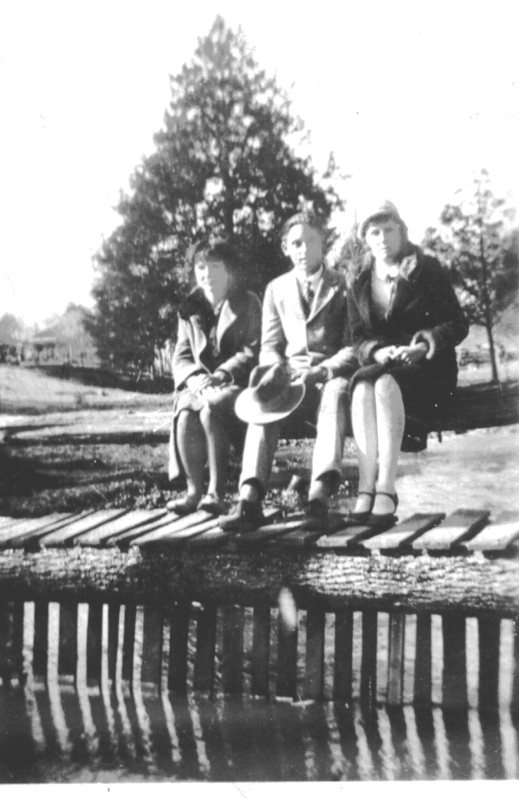 In 1929 the kids that I ran around with decided that we’d go to Huntsville, Alabama on a picnic. It was a good thirty-five miles to Huntsville. We had four cars. I don’t remember who all went, but I do know that Comer went. He drove a car. He was with a girl named Ruth Reynolds, and I was with her brother, Coy. Coy drove his dad’s 1928 Chevrolet coupe. His dad was a rural mail carrier and his car should have been in pretty good shape. Anyway, we decided that we’d meet at the Flintville post office at four in the morning. They said that the road to Huntsville was terrible, so they had decided to go to Fayetteville first and then go on the Fayetteville-Huntsville highway. I guess that it’s about sixty miles altogether. We left on time and had trouble from the start. The road to Fayetteville went through Kelso: a dirt road, muddy, and full of holes. We hadn’t gone ten miles when some-one had a flat. They took the tire off and put on a patch. Tires still had inner tubes then. Then some-one else had a flat and other things happened. One boy and girl had a fight and had to change places. At one O’clock we were at the river in Fayetteville. We’d been on the road for nine hours! We ate lunch on the bridge. The jail was there and we yelled at the men in jail. Then we all decided we’d better go back. Comer must have had the best car for he decided to go on and go back home the direct route. So we started back. First one would have a flat tire, then the lights would go out. We finally got back to Flintville at eleven o’clock that night. Only one of those three cars had lights by then and we were using a match for a fuse. Comer was already home. That was the last time we ever tried to go anywhere in cars!